A popular, sweet drink in China and neighboring Asian countries is called "grass jelly." One of the most common plants used to make grass jelly is Mesona chinensis, an herb in the mint family (Lamiaceae). The plants are boiled in water containing potassium carbonate. The juice is cooked and then cooled into a gelatinous consistency. 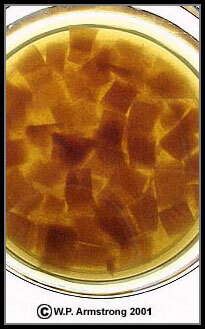 This jellylike material is cubed, mixed with water, syrup and flavorings and consumed as a refreshing drink. It is canned and sold in Asian markets as "grass jelly." According to Cornucopia II by S. Facciola (Kampong Publications, 1998), boiled figs (syconia) from the Asian creeping fig (Ficus pumila) are also used for grass jelly. The figs are picked ripe and placed in a porous bag to squeeze out the juice. The juice is cooked and then cooled into a gelatinous consistency called "pai-liang-fen." The jellylike material is cubed, mixed with water, syrup and flavorings and consumed as a refreshing drink. 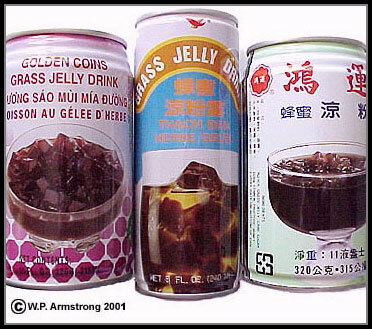 It is canned and sold in Asian markets as "grass jelly" of "ai-yu jelly." Many years ago, I watched my pet cat frolicking in the grass in the same place for about ten minutes. Close examination of this curious behavior revealed a slightly compressed catnip plant (Nepeta cataria) that had germinated in my back yard the previous spring. The seed source was apparently an old, dismantled catnip toy that had been discarded in the area years before. According to the Jepson Flora of California (1993), this European annual/perennial weed is naturalized in moist, shady areas throughout the state. A catnip plant (Nepeta cataria) in full bloom. 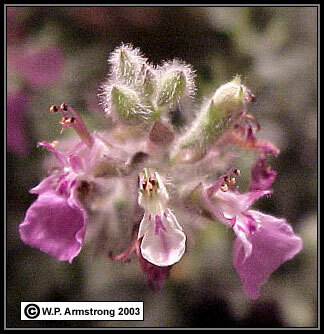 The square stem, opposite leaves and congested clusters of flowers along the stem are typical of the mint family (Lamiaceae). The catnip toy (right) is filled with dried leaves, stems and flowers containing nepetalactone. Note: The toy does not weigh 50 pounds as the label indicates. The attraction of feline mammals to the odor of catnip (also called catmint) is not limited to domestic house cats. In fact, is is apparently attractive to all members of the cat family (Felidae), including lions and tigers. The chemical in catnip responsible for the unusual and comical behavior of cats is nepetalactone, a methylcyclopentane monoterpene. 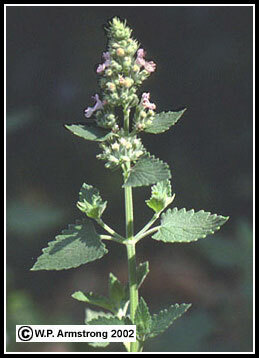 It is found in the leaves, stems and inforescences of catnip plants. 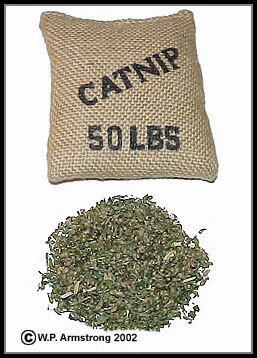 Dried leaves, stems and flowers are placed in catnip toys and sold in natural food stores as a medicinal tea. Nepetalactone occurs naturally in cis-trans and trans-cis isomers. These isomers have slightly different 3-dimensional shapes with respect to the position of the methyl group on the cyclopentane component of the molecule. According to the Merck Index (1983), the cis-trans isomer comprises 70-99 percent of the nepetalactone in catnip plants. Cat thyme (Teucrium marum), another member of the mint family (Lamiaceae) that is reportedly irresistible to cats. 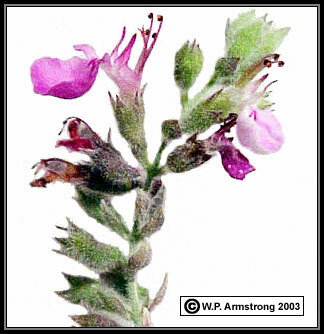 Other ornamental herbs in the genus Teucrium include North American germander (T. canadense) and European wood germander (T. scorodonia). Balm or lemon balm (Melissa officinalis), a fragrant perennial herb in the mint family (Lamiaceae). The leaves are used for flavoring salads, soups, omelettes, tarragon vinegar and sauces. Fresh or dried leaves also make a refreshing tea. The essential oil "balm" is obtained by distillation of leaves and the tops of plants. 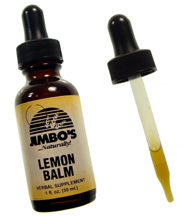 Lemon balm is native to the Mediterranean region and naturalized in North America, including San Diego County. The following information is from Health Plants of the World by F. Bianchini and F. Corbetta, Newsweek Books, 1979: Balm is one of the herbs beloved by healers since time immemorial. In the original Greek, melissa denotes not only the plant but also the bee. In ancient Greece sprigs of balm were placed in bee hives to attract swarms. 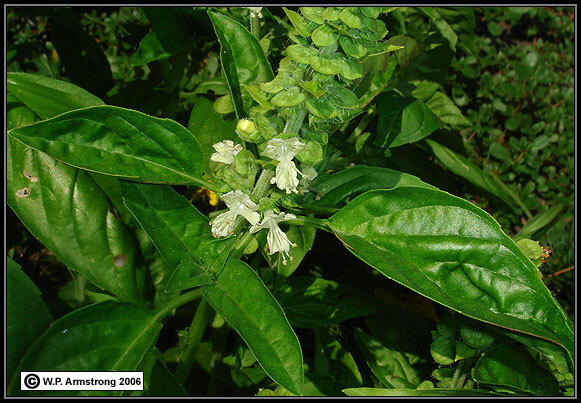 Balm was held in high esteem in early medicine, and was much used by the Arabs in Spain. It was also known in early cookery, especially as an ingredient of aromatic liqueurs distilled in Italian monasteries. Basil (Ocimum basilicum) is a fragrant annual herb in the mint family (Lamiaceae). The leaves are used for flavoring salads, sandwiches, soups and tomato sauce. In fact, tomatoes and basal have a delicious culinary affinity. Pesto, the thick Italian sauce used on pasta is made with basil, Romano cheese, pine nuts (or walnuts), salt, olive oil, and sometimes garlic. A basil leaf sandwiched between slices of a tomato and mozzarella cheese is another mouth-watering hors d'oeuvre. According to The Complete Book of Fruits and Vegetables by F. Bianchini and F. Corbetta, Crown Publishers, Inc. 1976, an infusion of basil is thought to have antispasmodic, stimulant, digestive, diuretic and other medicinal qualities. 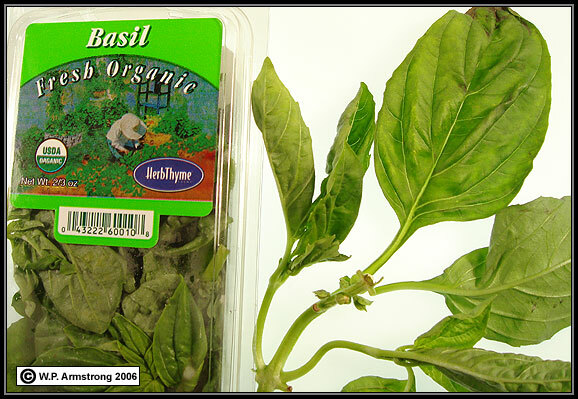 Basil is native to tropical Asia and widely cultivated in North America. Flowering stem of basil (Ocimum basilicum), a fragrant herb in the mint family (Lamiaceae). Horehound (Marrubium vulgare) is a European wildflower that has become dispersed throughout the United States, and one of the most common naturalized weeds in southern California. Like other members of the mint family (Lamiaceae), the flowers are grouped into dense clusters in the axils of opposite leaves along 4-sided stems. Each flower consists of a white, two-lipped corolla and a tubular calyx with ten spiny teeth that dry and curve outward in late summer and fall. 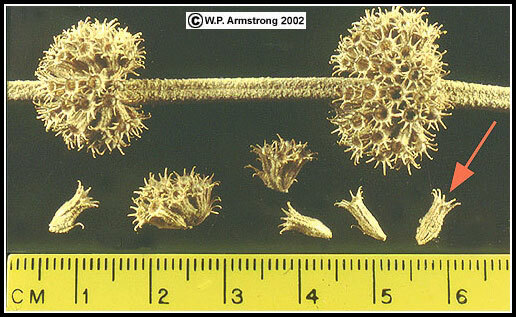 Each prickly, dried calyx containing four one-seeded nutlets attaches readily to the fur of animals or other passers-by. Without a doubt, horehound calyces will have a frequency of occurrence of 100 percent in your socks if you walk through a field of this plant in the fall. 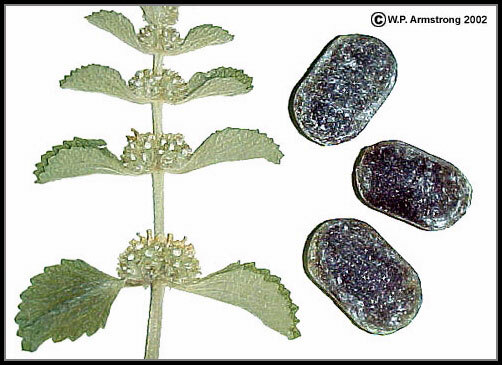 In the Wayne's Word Top 17 Hitchhiking Plants, horehound is ranked #13 with five "sock-removal-difficulty units" (SRDUs). It is not surprising that this weed has found its way across the entire United States. Horehound (Marrubium vulgare), a European herb that is naturalized throughout southern California. The flowers occur in dense, glomerate heads in the leaf axils. Like many other members of the mint family (Lamiaceae), the stems are square in cross section. Hooked spines on the persistent calyces readily cling to clothing and disperse the enclosed seeds (nutlets). Horehound candy (right) is made from a boiled infusion of fresh leaves plus a lot of sugar. A dried horehound plant (Marrubium vulgare) in the summer. This European herb is naturalized throughout southern California. The persistent calyces occur in dense, glomerate clusters along 4-sided stems. Each calyx (red arrow) has 10 hooked spines, one for each lobe. The dried calyces, each enclosing four one-seeded nutlets, readily attach to your socks and are very effective hitchhikers. 1. 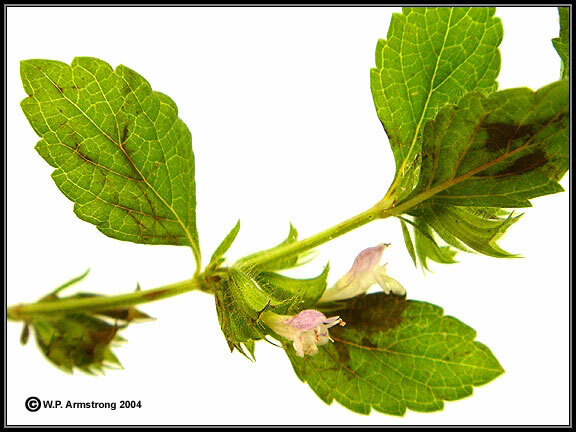 Make a strong horehound infusion: Boil one cup of fresh leaves with two cups of water for ten minutes. Let steep for five minutes and then strain. 2. To make horehound candy: Use one cup of horehound infusion to two cups of white sugar. Place sugar in small saucepan and stir in 1/8th teaspoon cream of tartar, then add the horehound infusion. Stir until the sugar has dissolved, then cook over low heat until it reaches 290 Fahrenheit degrees on a candy thermometer. [Or until a drop of the cooked infusion in cold water becomes a hard, glossy ball.] Pour on a buttered plate and score into cough drop sizes when it is semi-hardened. When cool, break apart into sections and store in a cool place until used. Lavender (Lavandula officinalis) is a perennial herb native to the mountains of southern Europe. This species is also listed as L. angustifolia ssp. angustifolia with a number of named cultivars. The flowers are typically produced in compact clusters (spikes) on long stalks extending above the foliage. Lavender oil is distilled from volatile monoterpenes in the flowers which typically bloom during late summer in the Alps and Pyrenees. According to R.W. Schery (Plants For Man, 1972), 4,000 tons of flowers may be used in one season. Lavender oil is usually blended with other essential oils in the delicate art of perfumery. The generic name Lavandula and common name "lavender" comes from the Latin lavare, meaning "to wash," because during Roman times this herb was used to add fragrance to wash water. Fernleaf lavender (Lavandula multifida), an attractive European species commonly planted along walkways in southern California gardens. 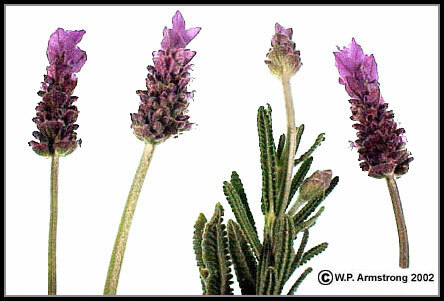 There are several other European species of Lavandula, including L. multifida of the western Mediterranean region. In southern California, this fragrant shrubby herb with gray foliage and purple flowers is commonly planted in herb gardens. It is sometimes referred to as "fernleaf lavender" because of its dissected leaves. 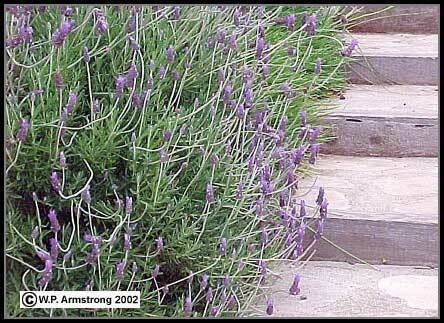 This drought resistant lavender is especially attractive as a border plant and along walkways. Close-up view of fernleaf lavender (Lavandula multifida), an attractive European species commonly planted in southern California gardens. The fragrant flowers are produced in congested spikes that extend above the foliage.